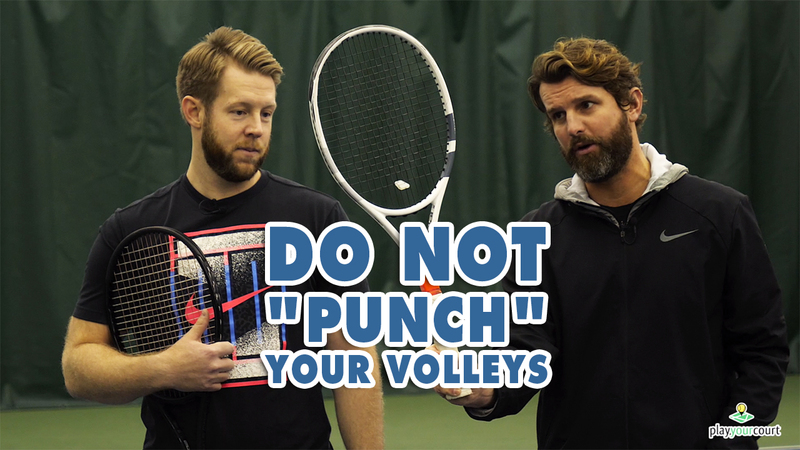 Today we debunk the myth that you should “punch” your volleys. This video is for players with a PlayYourCourt rating of 80 and below. – [Scott] Hey guys, Scott and Nate from PlayYourCourt.com and today we’re gonna tell you why you shouldn’t punch your volleys. Hey guys, so today we’re gonna debunk the myth that you’ve probably heard a lot about punching on your volleys. We actually don’t want you to punch on your volleys, and to be clear, this video is for players of the PlayYourCourt rating of 80 and below. 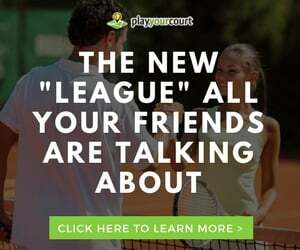 If you’re not in our community, or familiar with our rating system, a PlayYourCourt 80 is the same as a USTA 4.5. So, Nate, talk to me here. A lot of coaches, including some of the ones I had growing up, always told me to punch on my volleys. I hear it a ton. Turns out, this actually isn’t true, huh? – [Nate] Absolutely not. In fact, it’s dead wrong. It’s one of the worst teaching methods and myself, as well as, a junior heard this quite a bit and let’s get right into why is it incorrect? When punching, what that suggests is that there’s a coil and an uncoil. I’ve gotta retract my arm and then extract it, create force. – [Scott] When I hear punch, I immediately think of boxer. So I’m thinking pull back. – [Scott] Punch, right? And we know, with most volleys, it’s confusing. – [Nate] They break down because you’re actually pulling the racket back. There shouldn’t be a pullback really at all. So, I think it had good intentions, it’s just falling a little short and today we’re going to talk about, really, what most resembles volleys in its simple, simple catching the ball. Alright guys, so Scott and I here, you can tell we’ve put the rackets down. And all we have is a ball and we’re gonna play catch. Alright, and we’re, you don’t need to overthink this, this is just like you’d play it as a kid. Tracking that ball with your eyes, moving your feet, too and from the ball. So lets jump into it. Lets show you exactly what we’re talking about. How this really illustrates what the volley should feel like. – [Nate] Alright guys, so the important thing to note here is the position of Scott’s arm. Keeping it in 90 degrees much like an “L,” alright,and he’s trying to keep that elbow in front of the hip. And you’ll notice he’s extending to the ball, just like you would catch. Alright, so if I go high, he’s still extending out to the ball. And a lot of the work is being done with his feet, because that is why we say you volley with your feet. So now we’re on to the next progression, Scott now has a racket in his hand. And he’s really gonna feel the ball off the strings. And this is simply catching with the racket. Continental grip, face open, which automatically creates the backspin. And the feet are doing the work. Alright guys, so we hope you enjoyed that. With these progressions, get out there and work, or just a simple game of toss with a friend, and then get the racket involved. And then you can work on some reflex volleys back and forth. But the main thing here is that we stop taking our racket, and pulling the arm back, and then pushing the racket back out, as if we’re throwing this punch. We simply want to lead with the hands out in front, creating this “L” shape that you’ll see from my racket to my forearm. And then really using these soft hands, keeping the palm open on low balls, and then working above the ball on those high balls. And the volleys are just gonna be a lot easier, and you’ll probably understand why we do say volley with your feet. Because you’re extending out to the ball but the feet are really doing the work here. – [Scott] Yeah guys, like Nate said, really your hands are doing very little movement. All the work is with your feet. 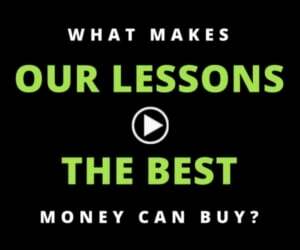 We hope you enjoyed this video, here at PlayYourCourt, Nate and I just want to see you improve your game. We don’t know a ton about you though so do us a favor, click the button below, answer a couple of questions for us about your game, and then we can send you some custom video content, based on the things you need to be working on. Click the button below and we’ll do the rest.